Posted bycraft9 April 15, 2019 Posted inUncategorized1 Comment on Hello world! Even though Cinco de Mayo is a relatively small holiday for our southern neighbors, the fifth of May has grown into a celebration of Mexican culture here in America. Part of that celebration includes indulging in some of Mexico’s signature sprits such as margaritas and, of course, beer. For home brewers the holiday is a great chance to show off some of your homemade suds and treat your guests to some Cinco de Mayo cervezas. When choosing the right beer recipe for your Cinco celebration, picking one that includes Mr. Beer’s Aztec Mexican Cerveza hopped-malt extract (HME) is kind of a no-brainer. With a label that easily calls to mind the popular Corona ads, the Aztec HME is low in IBUs (International Bittering Units) and is light-gold in color. While “cerveza” simply translates to “beer,” the Spanish term has now become synonymous with the Mexican-style brew that is captured in this can. You really can’t go wrong with brewing a batch of the Aztec on it’s own, but if you want to spice things up there are a few other recipes you might want to try out. First is the Fresco Chili Lime Beer. In addition to the all the ingredients provided by Mr. Beer, this recipe also calls for lime zest and even jalapeños to create a truly original brew that will perfectly fit the holiday. If spicy isn’t quite your thing perhaps you’d enjoy a little sweetness instead. In that case maybe a sample of Boysenberry Tart may be in order. The underutilized taste of boysenberry (which itself combines blackberry, loganberry, and raspberry) is highlighted in this beer and will go great with slice of lime in your beer. Finally another great option is the Noche de Luna recipe. This beer displays a more amber complexion than its paler counterpart and also contains a bit more alcohol. Still this malty cerveza will set the mood for a perfect May evening. There are many different interpretations of when the summer season truly begins. Though technically the solstice doesn’t come until June 21st, unofficial kick-offs like Memorial Day or the movie blockbuster season (which usually starts the first weekend of May) mean that Cinco de Mayo is really just around the corner from summer. As the weather gets warmer here are some recipes that will serve you well when you need a cold one. First up is the special edition recipe Barley’s Brew California Dreamin’. This unique beer not only includes vanilla bean and orange, but the recipe also calls for a little bit of vodka just to mix things up. Just like with their Saint Patrick’s Day collaboration, 10% of the profits from this Barley’s Brew will be donated to the Humane Society of Southern Arizona. Now that’s refreshing! While May 5th is dedicated to Mexican culture, the rest of the summer can be dedicated to All American Gold. With a relatively low ABV, this balanced brew is perfect for hanging out on a hot day. Speaking of America, let’s not forget that July 4th is the next big holiday on the horizon after Cinco de Mayo. With that in mind you may want pick up some Founding Fathers’ Ale to brew for the occasion. A beer light in color and bitterness, this home brew will go great with your Independence Day barbecue fare. Whether you’re looking for something to brew for your Cinco de Mayo get together or are just getting ready a hot summer, these Mr. Beer recipes are great choices for showing off your home brewing skills. Remember: since each beer takes about two weeks to brew, be sure to order your cerveza recipes and your Mr. Beer home brewing kit before it’s too late. Happy Cinco de Mayo! Not to be a buzz-kill, but the truth is that Saint Patrick’s Day has increasingly come to be known as amateur drinking night out at the bars. The great thing about being a home brewer is that you don’t need to deal with that scene. This year, why not brew some of your own beer for the occasion and invite some friends over to enjoy it with? Whether you’re in the mood for a traditional Irish brew or some easy-drinking green beer, try some of these recipes for your Saint Patrick’s Day festivities. What better to drink on Saint Patrick’s than a nice Irish stout? It just so happens that one of the hopped-malt extracts (HMEs) that Mr. Beer offers to home brewers is based on traditional Saint Patrick’s Day flavors. The company also offers a number of unique recipes based on that HME. One such recipe is Barley’s Smoked Stout. Mr. Beer has introduced this recipe especially for the season as a modern take on what they call a “lost art” of brewing. Plus what’s great about this particular recipe is that a portion of the proceeds will be donated to the Haven Humane Society of Southern Arizona. Who knew you could brew something good and do some good at the same time? For a real Irish original, try the Shillelagh Stout. This dark brew boasts a smooth malt taste with a slightly biter finish and also has a low ABV so you celebrate the holiday by tipping back a few. Finally there’s the Double Black Diamond which gets its name partially from the fact that it contains two full cans of Mr. Beer Saint Patrick’s Day HME. Just like a double black diamond slope on a ski range, this beer promises a complex and original flavor profile. With notes of everything from chocolate and toffee to nuts and hops, this brew is sure to stand out from the pack at your Saint Paddy’s party. Perhaps the only downside of enjoying a dark, malty, Irish beer on Saint Patrick’s Day is that it renders the tradition of dying the beer green nearly impossible. In that case, you may want to try one of Mr. Beer’s other great recipes that, with a couple of drops of food dye, will look just as festive as your guests will demand. Some of the most popular beers on the craft beer market today also lend themselves nicely to a dye job: IPAs. Given the “pale” in “India Pale Ale” these hoppy favorites will not only please your guests’ eyes but their taste buds as well. One such recipe is the Surly Dog IPA, which packs a strong hop punch you’d expect from a good IPA. If you’re looking for something with a bit more balance to the pallet, try Poor Richard’s Ale. Pale in color and low on alcohol, this brew is easy to drink and makes a great party option as a result. When you think about it, Cinco De Mayo is really just right around the corner from Saint Patrick’s Day. This year, why not get a little creative and cross cultures by serving some green cerveza at your Paddy’s Day party? The Chug-a-lugger offers delicious malt flavors in a pale complexion built around Mr. Beer’s Aztec Mexican Cerveza HME. This Saint Paddy’s, avoid the crowds and spend the night in with some delicious homemade beer. Thanks to Mr. Beer’s easy home brewing system, you’ll be able to impress your guests with these great Saint Patrick’s Day recipes. Just don’t be too surprised when they invite themselves over for Cinco De Mayo… and every holiday after. What if instead of getting them another case of beer that they’ll finish in a few weeks you got them something they can use for years to come? 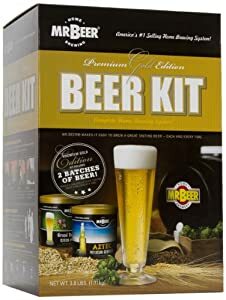 They say if you want something done right you have to do it yourself and the Mr. Beer home brewing kits help your beer lover brew the perfect beer each time. When you pick up a Mr. Beer kit for your beer fan they’ll be able to get started making beer right away. Of course the kits also include complete instructions that will show them just how easy it is for anyone to brew the perfect beer. After the first successful brew the fermenter and bottles can be reused (after proper sanitation) to make the next delicious project. With the Mr. Beer home brewing kits you didn’t just give them a six-pack, you bought them a brewery. Best of all Mr. Beer has a full line of supplies and ingredients so your beer lover can create a variety of styles and flavors throughout the year. Perhaps the best thing about a Mr. Beer kit is that it is only the beginning for your beer lover. Home brewing is a hobby that is quickly gaining popularity. It’s also one with nearly endless possibilities. Just as even the most skilled chef is always learning new techniques and flavor combinations to create the best dishes, your home brewer will grow to learn how to create unique beers and ciders they can call their own. Of course Mr. Beer also has plenty of ideas to point them in the right direction. There are hundreds of beers to choose on Mr. Beer’s website. Each recipe pack comes with all of the ingredients you need to brew the perfect beer. From hoppy IPAs to sweet malty stouts to fruity beers and even ciders, the Mr. Beer system allows home brewers to create whatever they want from their favorite beverages. While the Mr. Beer brewing process is clearly explained in the directions making it accessible to beginners, Mr. Beer is truly the gift that keeps on giving. A lot of thought was put into the design to make it easy for anyone to brew great tasting beer throughout the year. There is something to be said about the feeling of satisfaction one gets from brewing your own beer. In about four weeks your beer lover will not only have a delicious batch of brew to enjoy but a sense of accomplishment and perhaps a newfound appreciation for the brewing process. That’s something they won’t be able to find in any liquor store. The Mr. Beer brewing kit makes a great and unique gift for any craft beer drinker. Starter kits come in a variety of sizes, so you can find one that not only fits your recipient’s needs but also your gift giving budget. Check out our Mr. Beer selection today to find the perfect gift for your beer lover.